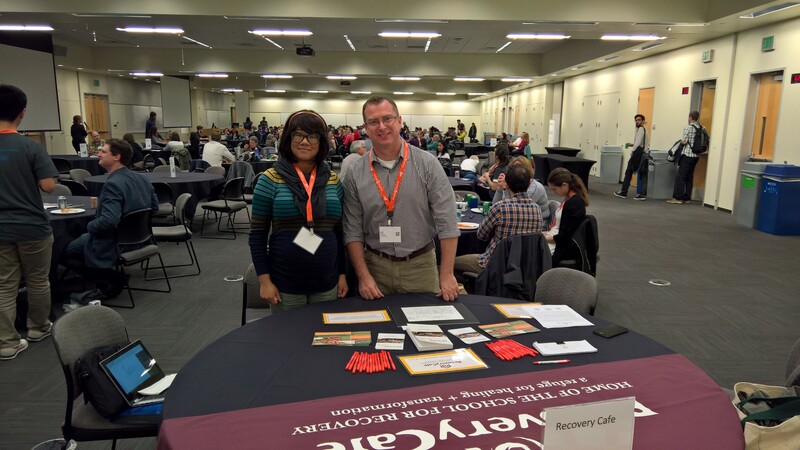 Recovery Café was one of only 24 Seattle-based nonprofits selected by Seattle GiveCamp to participate in a three-day hackathon for good! Seattle GiveCamp is a 501(c)(3) agency that hosts an annual weekend-long event on the Microsoft Campus to match nonprofits with software professionals from companies throughout the greater Seattle area who donate their time and expertise to design, develop, and implement low-cost and no-cost tech solutions. From October 14th to October 16th Jeff King and Ashley Dykstra teamed up with a group of 10 tech volunteers to develop a volunteer sign-in and sign-out scheduling system for Recovery Café’s wonderful Ministers of Presence and School for Recovery Instructors. The purpose of this digital time clock is to allow volunteers to spend more time doing meaningful work and actively participating with the larger recovery community rather than searching for multiple sign-in sheets. Our volunteers are an invaluable resource offering daily encouragement and support to our Members! We wish to extend a special thank you to Seattle GiveCamp organizers for arranging this wonderful event and an extra special thank you to our dedicated tech volunteers who worked so hard and braved the rainy and windy weather to ensure we have a streamlined, user-friendly scheduling system.